Sixteen students from Harris County Department of Education’s Scholastic Art & Writing Awards Regional Affiliate program traveled to New York City to Carnegie Hall on June 7 to gain national awards as Gold Medalists. and colleges that a student is an accomplished artist or writer. Alexis Cazares, Melissa Sosa and Emilio Recio of Pasadena Independent School District; Hetian Duan, Houston Christian High School; Walter Hammann, Clear Creek ISD; Gracin Nguyen, Pearland ISD; Olivia Pierce and Kaitlyn Sheroke, Katy ISD; Emma Bennett, Houston Independent School District; Alexis DePinho, St. John’s School; Esha Garg, The Village School; Amabel Letrung, Klein ISD; David Liang, William Miner and Cg Marinelli of The Kinkaid School; and Shadidhar Pinninti, The Village School. Each year celebrities attend the ceremony through surprise appearances. This year, American actor, singer and DJ Ansel Elgort was a star attraction. Elgort starred in the horror film Carrie and will star in the upcoming movie The Goldfinch. Other star guests at the celebration included children’s author R.L. Stein of Goosebumps and author Marc Brown of the Arthur series. Students and teachers traveling to Carnegie Hall ceremonies and celebrations throughout the week called the experience unforgettable. “I felt like getting to visit Carnegie Hall was a very unique, once-in-a-lifetime opportunity,” said student Shasi Pinninti, The Village School. “It was wonderful to hear from R.L. Stine and Marc Brown about their experiences and their struggles in the real world, and it inspired me to (hopefully) one day write a novel,” said Esha Garg, student from The Village School. HCDE Scholastic Art & Writing coordinator Andrea Segraves provided leadership this year as Affiliate Advisory council member. The committee is a working committee which provides communication between members of over 100 affiliate networks, the board and the national staff. The regional Scholastic Art & Writing Awards begins the 2019 awards in the fall of 2018. For more information about judging, sponsoring or entering, go to www.hcde-texas.org/scholastic . 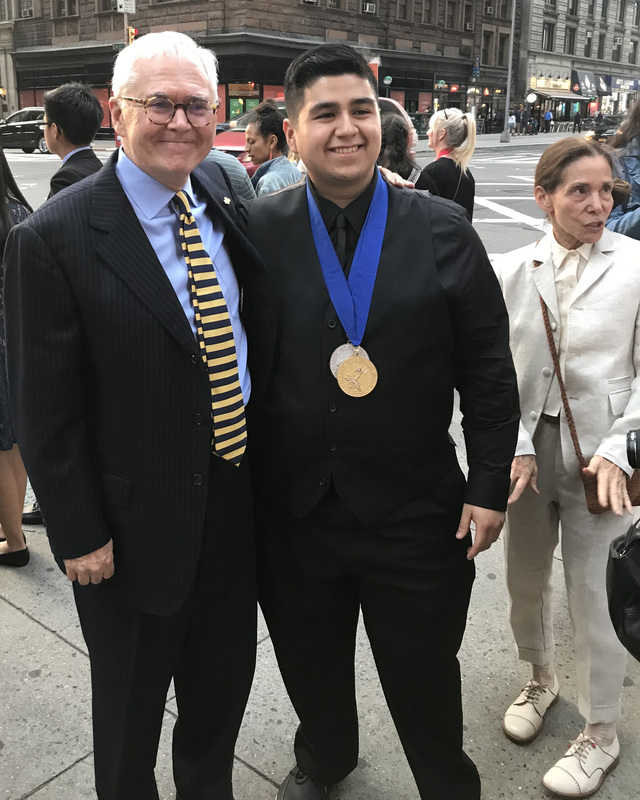 Photo: Children’s author Marc Brown (Arthur series) poses with Pasadena ISD student Emilio Recio after a surprise appearance at Carnegie Hall during the ceremony.